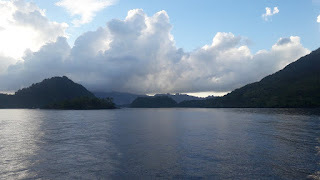 We sailed into Banda's harbour at daybreak. Beautiful setting in a very historic environment. We continue diving tomorrow in the Banda area. Susan's in San Diego visiting sister Diana. They had lunch with Karin and Claes, friends from Uppsala, today in Oceanside. Small world!